Over the years, Kumon has learned from many parents and children the importance of verbal communication for infant and child development. Joint studies with universities have shown that singing songs and co-reading with children strengthen the bonds between parent and child, and lays the foundation for future learning. The time when children read picture books together with their loving mother, father, and caretakers is a time of tremendous happiness for them. These enjoyable early experiences in a comfortable environment have a very positive effect on children’s interest in books. Picture books are a rich source of vocabulary and stories that capture children’s interest and stimulate their curiosity. This is also a valuable opportunity for children to learn about empathy and kindness. Parents and children experience joy by co-reading. It is a time for children to become familiar with many new words as well as the world around them. Co-reading with children encourages them to like books. As a result, they naturally develop a strong interest in reading. Children’s songs and nursery rhymes are melodious and have a gentle tempo, which makes the words and phrases easy to remember. Children naturally memorize lyrics and develop their vocabulary when parents and caretakers repeatedly sing to them. As children increase their vocabulary, they learn to think for themselves and control their emotions. They also develop the ability to communicate effectively with the people around them. We have learned from parents and children who enjoy songs and picture books together that these activities enable parents to more fully observe their children in a natural way. By making a written record of that observed behavior, parents become more aware of their children’s progress. This creates a happy cycle that makes parent-child interaction even more enjoyable. 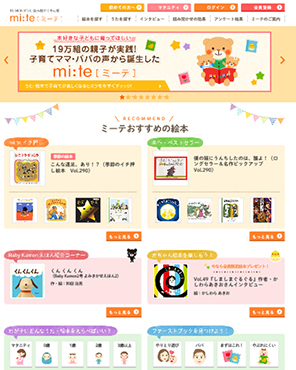 “mi:te” is a child-raising support website for parents offered by Kumon. 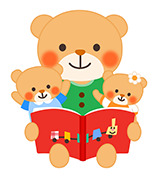 With this website we hope to encourage parents to sing songs with their children, co-read picture books and keep a written record of their children’s development. We believe that verbal communication is the best way to reinforce the parent-child bond and prepare a solid foundation for later growth. mi:te features information for parents about popular picture books and how children respond to them. On the mi:te website you will find information about newly published picture books and about picture books that are appropriate for each season of the year. We encourage you to use mi:te as a reference source for co-reading.